Forecast of higher US exports and lower global production are bullish for rice price. Will the rice price continue rising? The June US Rice Outlook estimates a decrease in global rice production and ending stocks, and an increase in US export forecast for 2018/19 season. In global rice market the production was lowered 2.15 million tons to 487.4 million due to a smaller crop forecast for China, the largest rice producing country. However global rice trade in calendar year 2019 remains projected at a record high of 49.5 million tons, and US exports in 2018/19 were upgraded by 2.0 million cwt to 103.0 million cwt. Lower expected global production and higher US exports are bullish for rice price. 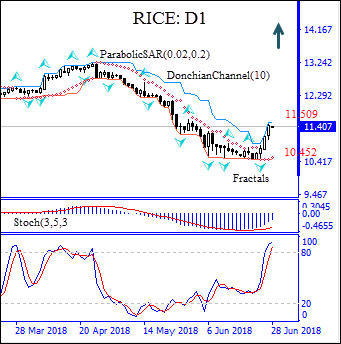 On the daily timeframe the RICE: D1 has been rising after hitting 13-month low two days ago. The Stochastic oscillator is in the overbought zone, this is bearish. We expect the bullish momentum will resume after the price breaches above the upper Donchian bound at 11509. A price above that level can be used as an entry point for a pending order to buy. The stop loss can be placed below the lower Donchian bound at 10.452. After placing the pending order, the stop loss is to be moved to the next fractal low, following Parabolic signals. By doing so, we are changing the probable profit/loss ratio to the breakeven point. If the price meets the stop loss level (11.509) without reaching the order, we recommend canceling the order: the market sustains internal changes which were not taken into account.